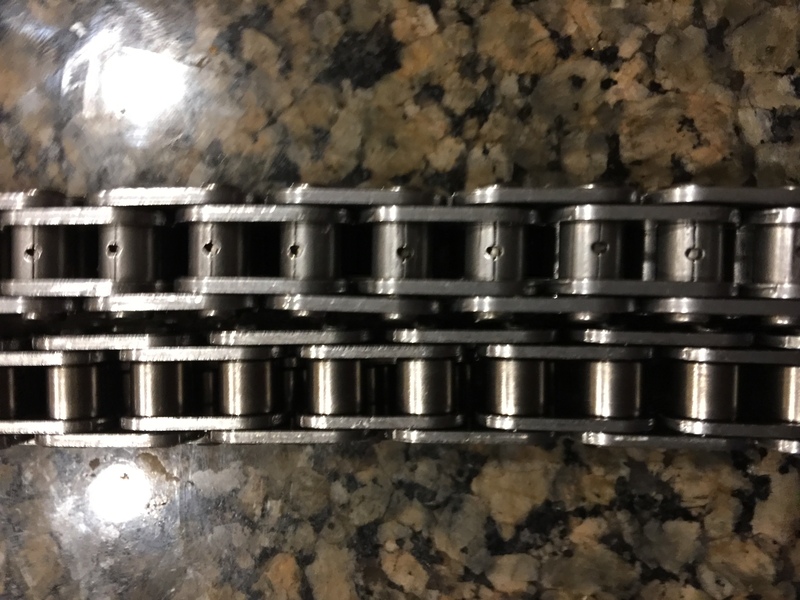 Often times when people think of the load put on their timing chain, they think of the load exceeding the tensile strength of the chain. In reality, what’s actually occurring is a series of abrupt starting and stopping, accelerating and decelerating of the crank and camshaft at different frequencies. In other words, if you were able to measure the load placed on the timing chain, you wouldn’t see a constant tension load, rather a series of shock loads. Shock loads are what destroys things. 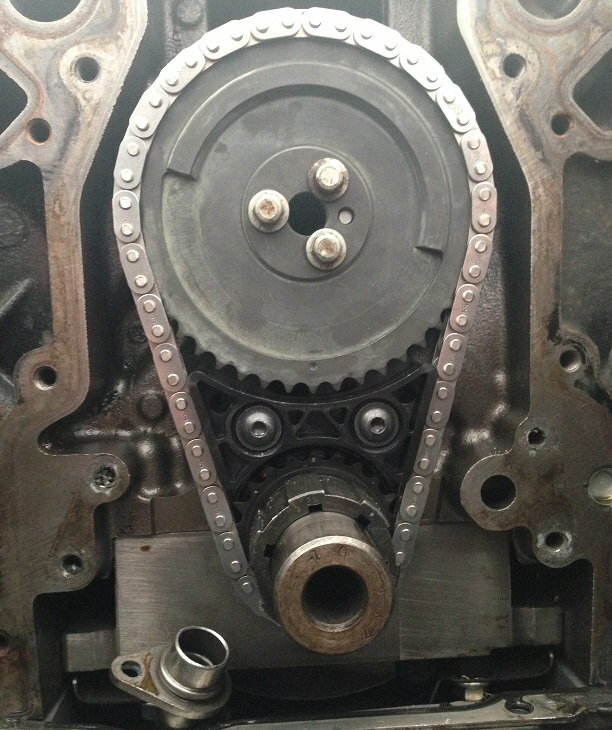 Many things determine the shock loads placed on your timing chain. These things include the ramp rates of the camshaft, the spring tension, engine RPM and the stability of the valve train overall and lastly, any kind of rev limiting electronics. 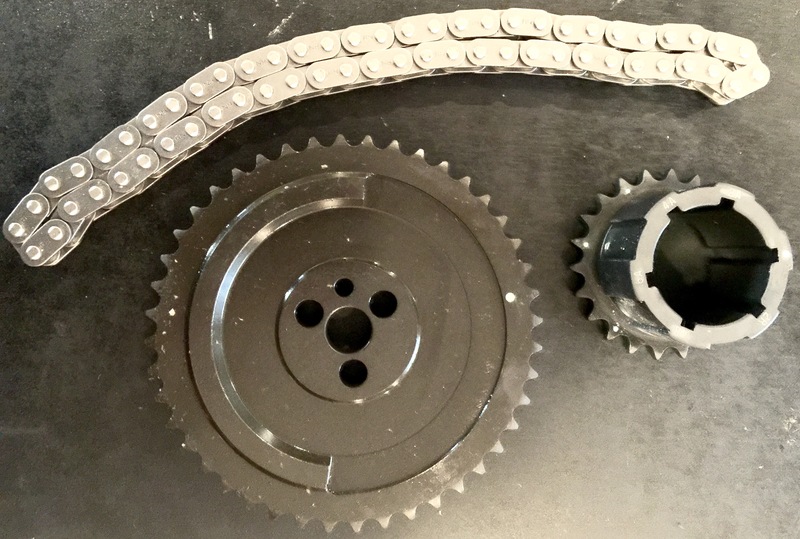 The timing chain has no real ability to absorb shock and trying to design one that does is a bad idea because it will affect the accuracy of your valve timing. The stock timing chain was designed for the stock camshaft and springs. Part of the recipe for increased performance includes a larger camshaft with more aggressive ramps as well as increased spring pressures. While you may get away with using the stock timing chain, it doesn’t make it a good idea. Double row timing chains use smaller links with smaller pins, offering no real advantage. For many years, the C5R chain has been the gold standard in timing chains. Now at the conclusion of much research and development, I bring you the Elite Chain Drive, bigger, better and stronger than anything offered before. The heavy duty pins are much larger than their counterparts. Not only that, but they’re cold formed and loaded with chromium to keep their strength at the highest point. The links are equally robust. The drive gears are billet. They are machined, vibratory polished, heat treated, vibratory polished again, manganese phosphate treated and then stamp marked. Instead of black oxide coating the gears, which serves no purpose, we chose to coat them in manganese phosphate. If you take the time to read about this process, you’ll soon discover that it goes above and beyond providing excellent corrosion resistance (which is all that black oxide coating provides). It, in fact, provides friction resistance and offers anti-galling advantages. The first picture below shows a C5R chain, a C7R chain and then the Elite Drive Chain on the bottom. The second picture shows you the oiling hole in the rollers, designed to help keep the pins cool and lubricated. I’ve met so many people focus on every other part on their build and then neglect a part that can bring the entire house down, the chain. Don’t be that guy. The chain is only offered complete with the gear set for now. The drive gear has 2,4 and 6° advance and 2,4° retard positions. Pricing for the LS1/2/6 chains has gone down to 189.00 shipped. Texas Customers, add 8.25% tax. Credit cards, cash and PayPal accepted. For credit card payments, I use Paypal and will require your email address to send an invoice. I ship to the PayPal confirmed address. when ordering, please specify which kit you need. Last edited by [email protected] Performance; 06-28-2018 at 03:28 PM. Installed mine today. Fits great with a Trick Flow chain dampener. 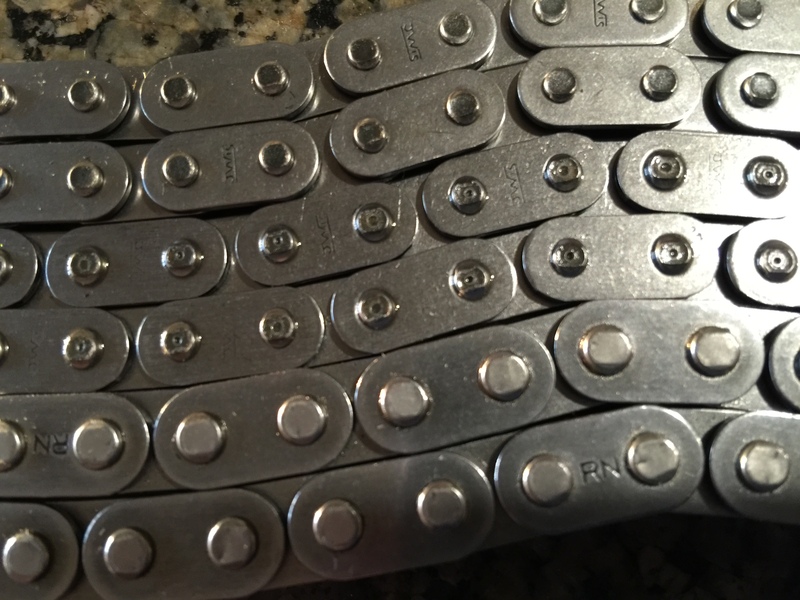 I didn't take any pictures of the double roller I removed, but this chain has less slack. I like the oiling holes in the rollers of the chain (and its weight reduction!!). Also, the drive gear fit tighter on the crank than the drive on the set I removed. Thanks for a great product Bret! Last edited by CamminC5; 04-15-2016 at 08:47 PM. 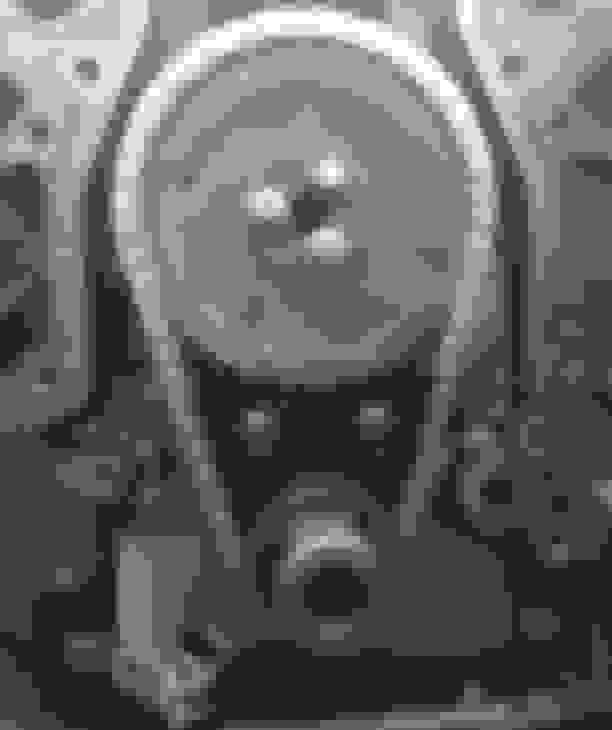 I've installed one of these on an engine I'm building. I can say from now on this timing set will go on any LS engine that I build for myself or anyone else from here on out. Last edited by MVP'S ZO6; 04-15-2016 at 08:48 PM. Thanks guys, I'm excited about it. My apologies Chris, I brought it out as soon as I was able. Looks like I may be needing one after all. Let me know and I'll get one on the way. I've got plenty. Not a bad idea, thanks for looking out. After final assembly I heard some rattle and thought my chain was shot. But I borrowed a new one local and it sounds the same, so I figure it's ok. I pulled my motor to fix a rod knocking, it had a bearing going out. Thanks man I'm going to leave it be for this 347, and save up for a 427 LSx. I can also get you Diamond, Wiseco, K1, Callies, MAST and more. Let me know if I can help buddy. Interesting, good luck with them Bret. Not intending to derail the thread but if you happen to have a stock stroke dragonslayer available message me lol. I ended up with LSA crank but starting to reconsider. Last edited by Shoaf85; 04-18-2016 at 04:19 PM. I don't stock them. I order them as needed. Thanks for all your orders! any idea if this is going to be offered with more of an adjustable set up?